The third most powerful hurricane on record to hit the U.S. mainland has caused widespread damage in several southern states. It also led to at least two deaths. Hurricane Michael struck land in northern Florida Wednesday as a Category 4 hurricane, with winds up to 250 kilometers per hour. On Thursday, Michael weakened to a tropical storm – with winds of about 80 kilometers per hour - as it kept moving northeast. Weather officials believe the storm will pass over North and South Carolina before heading out to the Atlantic Ocean in coming days. Emily Hindle lies on the floor at an evacuation shelter set up at Rutherford High School, in advance of Hurricane Michael, which made landfall, in Panama City Beach, Fla., Oct. 10, 2018. One man was killed when a tree fell onto his house outside Tallahassee, Florida. In southwest Georgia, an 11-year-old girl died after debris from the storm hit her home. More than 700,000 homes and businesses were left without power in Florida, Alabama and Georgia. Thousands spent the night in shelters after fleeing their homes to escape the storm. 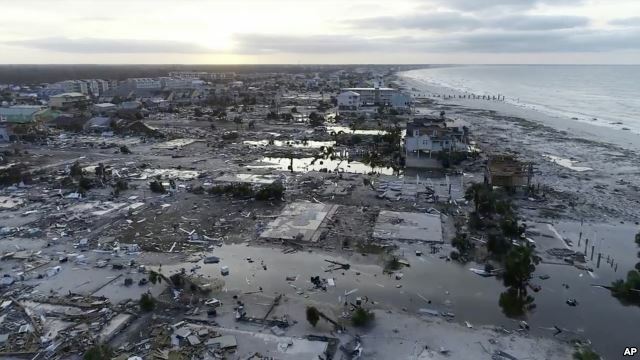 Television footage showed flooding and destruction in the small Florida town of Mexico Beach, where the storm first made landfall. Many homes were shown covered with floodwaters up to their roofs. Wood and metal from destroyed buildings covered streets and moved through flooded neighborhoods. A number of buildings were destroyed or left without roofs in nearby Panama City, Florida. Empty streets were covered with storm debris, fallen trees and downed power lines, the Associated Press reported. The storm left hundreds of cars with broken windows, the AP said. Many of the cars had been moved by the wind. Brock Long leads the U.S. Federal Emergency Management Agency, or FEMA. He said Michael was the most intense hurricane to strike that part of Florida since record keeping began in 1851. Overall, Michael was the third strongest storm on record to strike the U.S. mainland. Only Hurricane Camille on the Mississippi Gulf Coast in 1969 and the unnamed Labor Day hurricane of 1935 in Florida were more intense. U.S. President Donald Trump spoke about the storm on Wednesday night. He offered his 'thoughts and prayers' to those in its path. He said he would be visiting Florida soon. Rick Scott is the governor of Florida. He said about 3,500 Florida National Guard troops and more than 1,000 search and rescue experts had been activated. The U.S. Defense Department sent an additional 2,200 military troops to the area, along with helicopters and water rescue vehicles. Scott promised his government would do everything it can to help communities suffering effects from the storm. Even though Michael's winds had eased, the storm was still expected to drop heavy rain across many parts of the U.S. East Coast, leading to possible flooding.